Citizens for a Nuclear Free Iran (CNFI) is an offshoot of the American Israel Public Affairs Committee (AIPAC) founded in 2015 to “educate the public about the dangers” of the nuclear agreement reached between Iran and the “P5+1” world powers in July 2015. “AIPAC seems to regard its own brand as toxic, and maybe Israel’s brand too … Notice that the [CNFI’s] ad says not a word about Israel, which is deceptive,” Mondoweiss’ Philip Weiss has said of CNFI. One prominent MEK supporter, former Sen. Joe Lieberman, is also a member of CNFI’s advisory board. Lieberman has addressed MEK gatherings in the past and has said the United States “should be working closely” with the group, which advocates for regime change in Iran and has a history of committing violent attacks inside the country. CNFI’s other advisors are also former hawkish Democratic members of Congress, including former Sens. Evan Bayh (IN), Mark Begich (AK), Mary Landrieu (LA) and former Rep. Shelley Berkley (NV). The Nation’s Ali Gharib remarked about CNFI’s advisory board: "It's sort of a remarkable list when you look at it. I mean, it's obvious why AIPAC picked them, they're the most stalwart-like traditionally pro-Israel figures that have come off the Hill in recent years." Julie Hirschfeld Davis, "Pro-Israel Aipac Creates Group to Lobby Against the Iran Deal," The New York Times, July 17, 2015,http://www.nytimes.com/politics/first-draft/2015/07/17/pro-israel-aipac-creates-group-to-lobby-against-the-iran-deal/. Catherine Ho, “AIPAC spend record $1.7 million as it lobbied Congress to review Iran deal,” The Washington Post, July 20, 2015,http://www.washingtonpost.com/news/powerpost/wp/2015/07/20/aipacs-lobbying-spending-spikes-as-group-pushes-hard-to-oppose-iran-deal/. 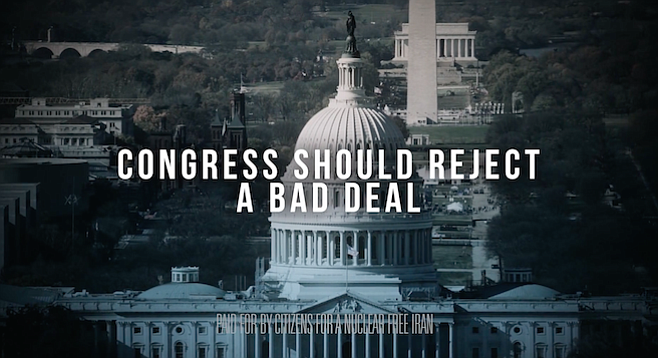 Adam Kredo, “AIPAC-Linked Group Launches $5 Million Ad Campaign Against Nuke Deal,” Free Beacon, July 17, 2015, http://freebeacon.com/national-security/aipac-linked-group-launches-5-million-ad-campaign-against-nuke-deal/. Philip Weiss, “If Americans support Iran deal, 56-37, what gives Israel the power to ‘croak’ it?” Mondoweiss, July 21, 2015,http://mondoweiss.net/2015/07/americans-support-israel. 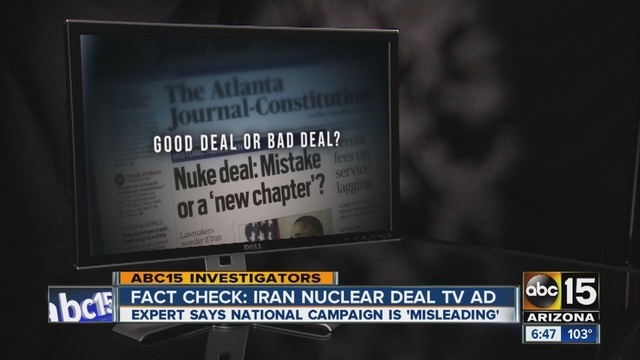 Dave Biscobing, “FACT CHECK: Expert says Iran nuclear deal TV advertisement is 'misleading,'” ABC 15 Arizona, July 24, 2015,http://www.abc15.com/news/national/fact-check-expert-says-iran-nuclear-deal-tv-advertisement-is-misleading. Eli Clifton and Ali Gharib, “Anti-Iran Deal AIPAC Spin-off Relies on Iranian Ex-Terrorist Group,” LobeLog, July 21, 2015, http://www.lobelog.com/anti-iran-deal-aipac-spin-off-relies-on-iranian-ex-terrorist-group/. All In with Chris Hayes, "Iraq War proponents campaign against Iran Deal," MSNBC, July 21, 2015, http://www.msnbc.com/all-in/watch/iraq-war-proponents-against-iran-deal-488888387631.